Mary Wright’s book, Cornish Guernseys & Knit-frocks (Polperro Heritage Press, 2008) provides instructions for the pattern on the front of the jersey worn by Hawker in many of his portraits. As well as including the pattern itself – she calls it ‘Slate’ – she makes a couple of references to Hawker in the main text, one of which is accompanied by the familiar photo of him standing at the door of his vicarage. The stitch pattern is a simple one to follow, although for working a flat sample I had to adapt the instructions and knit on two needles rather than the traditional circular one. Mary Wright describes the yarn used for making guernseys as ‘dark navy worsted, in four- and five-ply’, and explains that even though many people (including me) assume that it was oiled, this wasn’t the case – the weatherproof finish relies on using a yarn with a tight spinning twist worked on fairly fine needles to create a closely knitted fabric. An online search showed that although ‘Guernsey 5-ply’ was readily available, obtaining a single ball of navy was more of a problem, so I ended up buying a lighter blue than Hawker probably wore. The book is full of interesting old photos and is well worth reading for the information it contains on life in the Cornish coastal villages in the late nineteenth century. 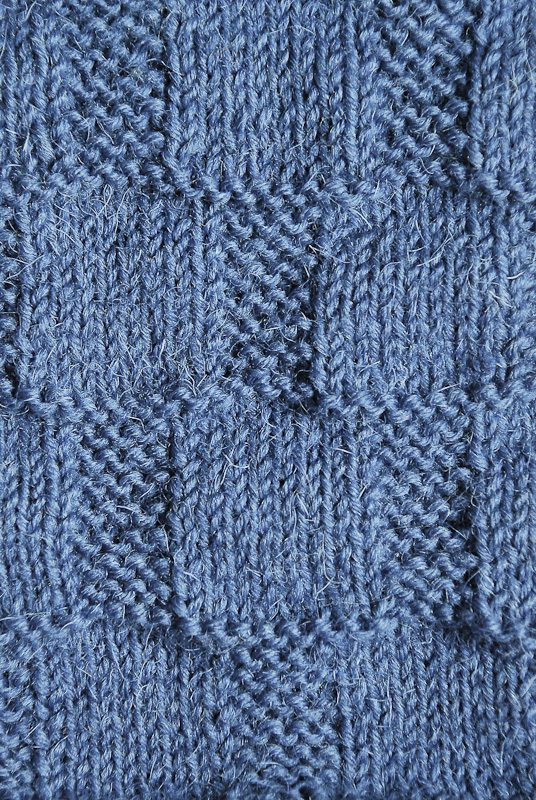 The pattern sample I knitted is only about 8″ square but anyone with good knitting skills could probably incorporate the design into the ‘Cornish Jersey – Basic Pattern’ provided in the second to last chapter. Writing in The Life and Letters, C. E. Byles describes the making of Hawker’s socks using wool from his own sheep, spun at Welcombe and knitted by children at St Mark’s school, but although I seem to recall that his jerseys were knitted at Clovelly I can’t find the reference to back this up right now. I knitted my sample during a stay at Welcombe in September 2011, which made the undertaking even more enjoyable.